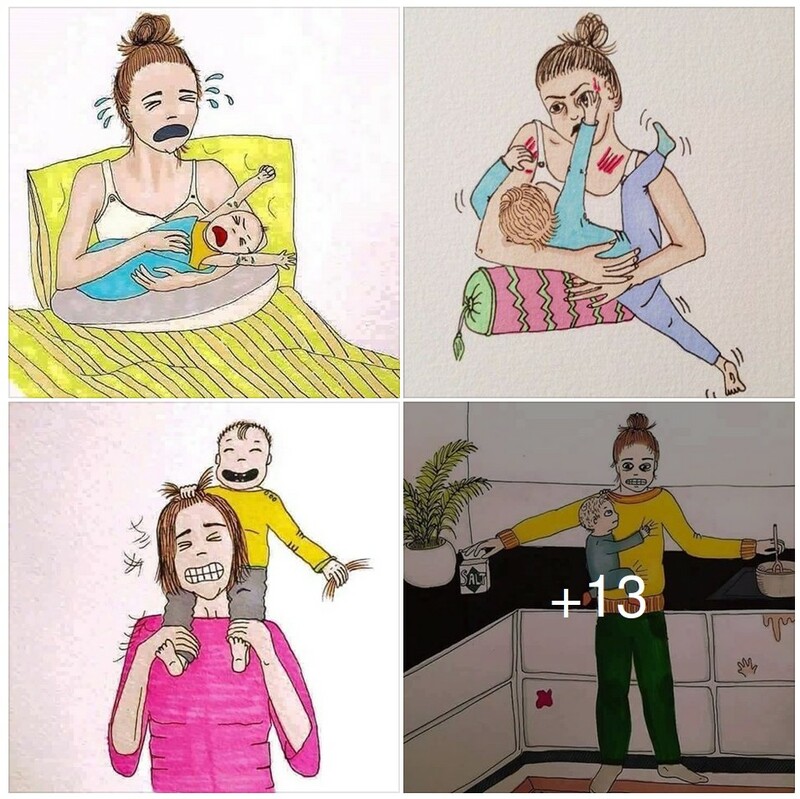 Logical Indian, a popular Facebook Page, posted a series of illustrations which purportedly portray the hardships that a mother has go through while raising a child. These illustrations were by an Instagram user (@ab.bel). Along with the 16 illustrations, they also posted a textual introduction to the post which angered a lot of women. [pullquote align=”full”]Being Mother, Isn’t Easy! Being a mother is a special award for women. In a way, motherhood completes her and it is a bundle of joy, but surely not an easy thing in a life of a woman. These pictures are from an illustrator on Instagram with the account name @ab.bel. All mothers can relate to these and will bring a smile on their faces and for all others, you could understand how tough it would have been for your mother to raise you. While a lot of people liked the post and it got over 16k likes and 5k shares, the specific claim that ‘motherhood completes women’ caused a lot of consternation among both male and female commentators on the post, especially women. In this post, we will carry some of the criticisms. Sanjukta Basu wrote an open letter to Logical Indians FB Page in which she critiqued their stance at length. Get logical. Motherhood doesn’t complete a woman. Nothing does. Because you know what, a woman is not incomplete to begin with. She is born complete. She is complete because she exists. Because she was born a full human and is not waiting to be completed by a man, marriage or motherhood. These are mere personal choices a woman makes. They neither define her nor complete her. Hard for you to understand I know, because according to your understanding a man is the default position, woman is the odd variation. Man is the general, universal, woman are the other. It is little surprise that the most famous tagline for a men’s clothing brand goes, ‘the complete man’ not ‘a complete man.’ It is not like a certain man becomes complete in a certain way. The human male specie is complete by default. But no, please apply a bit more logic than that and understand that women are born as complete human being. Because until you understand this, you will never understand why women demand equal human rights. And when we are at it, what completes a man, may we ask? What about fatherhood? Why don’t we have similar common tropes telling a man you were born incomplete until so and so happen. You only become complete when you become a father. That no matter how difficult it gets to bath and feed a child, you bear it because THAT is your greatest reward and your greatest purpose. Why don’t we have popular culture, literature art, filled with such motifs bounding a man to domesticity and house work by glorifying his duties as husband and father? Before posting these sketches, as lovely as they are, why didn’t it occur to you that in all the images the women is struggling alone with the baby, where is the father? Out of the 16 images, the father is seen in only one, spotted sleeping. The mother is breast feeding, cooking, playing, doing grocery, watching TV, trying to attend a phone call, she is always alone, with her baby clinging on. If the mother can do all these alone, why should she marry at all? Why don’t we accept single mothers with open arms sans judgement? You would probably argue about independent choice in a free modern society. Please understand ‘free choice’ doesn’t exist out of context and without conditioning. There are no free lunches remember. Our choices are conditioned by societal standards, expectations, definitions of good woman, bad woman. You quoted Robert Browning in the post, if indeed Browning said these words, he must have said them sometime before 1889 (year he died). And we are still using his words to reinforce the same idea. Such words and motifs put the pressure on woman to perform in a certain way and that’s when their individual choices get influenced by social expectations. Choice is a slippery slope. Your page has a following of over 49 lacs people. Any medium with that kind of mass outreach should really be a bit more logical and responsible. Read up, learn about issues, because you are influencing a lot of young minds here. Tomorrow if a man shames a woman for being ambitious, for putting her career over motherhood, and tells her that she is less of a woman, incomplete and inconsequential unless she is a mother, you Logical Indian would be responsible. Logical Indian has often posted content via which they try to appeal to the emotional side of people. However, while doing so, they should be aware of the sort of issues they drum up emotions regarding. In this particular case, the suggestion that a woman is incomplete without motherhood, is one such issue where they should have deliberated harder before posting such content.